Nirvighnam kuru mey Deva, Sarva kaaryeshu Sarvadaa"
One day Goddess Parvati was at home on Mt.Kailash preparing for a bath. As she didn’t want to be disturbed, she told Nandi, her husband Shiva’s Bull, to guard the door and let no one pass. Nandi faithfully took his post, intending to carry out Parvati’s wishes. But, when Shiva came home and naturally wanted to come inside, Nandi had to let him pass, being loyal first to Shiva. Parvati was angry at this slight, but even more than this, at the fact that she had no one as loyal to Herself as Nandi was to Shiva. So, taking the turmeric paste (for bathing) from her body and breathing life into it, she created Ganesha, declaring him to be her own loyal son. The next time Parvati wished to bathe, she posted Ganesha on guard duty at the door. In due course, Shiva came home, only to find this strange boy telling him he couldn’t enter his own house! Furious, Shiva ordered his army to destroy the boy, but they all failed! Such power did Ganesha possess, being the son of Devi Herself! This surprised Shiva. Seeing that this was no ordinary boy, the usually peaceful Shiva decided he would have to fight him, and in his divine fury severed Ganesha’s head, killing him instantly. When Parvati learned of this, she was so enraged and insulted that she decided to destroy the entire Creation! Lord Brahma, being the Creator, naturally had his issues with this, and pleaded that she reconsider her drastic plan. She said she would, but only if two conditions were met: one, that Ganesha be brought back to life, and two, that he be forever worshipped before all the other gods. Shiva, having cooled down by this time, and realizing his mistake, agreed to Parvati’s conditions. He sent Brahma out with orders to bring back the head of the first creature he crosses that is laying with its head facing North. Brahma soon returned with the head of a strong and powerful elephant, which Shiva placed onto Ganesha’s body. Breathing new life into him, he declared Ganesha to be his own son as well, and gave him the status of being foremost among the gods, and leader of all the ganas (classes of beings), Ganapati. Shiva symbolizes the Soul, who seeks to meet his consort Parvati or Para-Shakti (Supreme Energy), which is symbolic of Kundalini energy which resides at the Muladhara Chakra. It is said that when we purify ourselves, ridding ourselves of the impurities that bind us, then the Lord automatically comes. This is why Shiva, the Supreme Lord, came unannounced as Parvati was bathing. 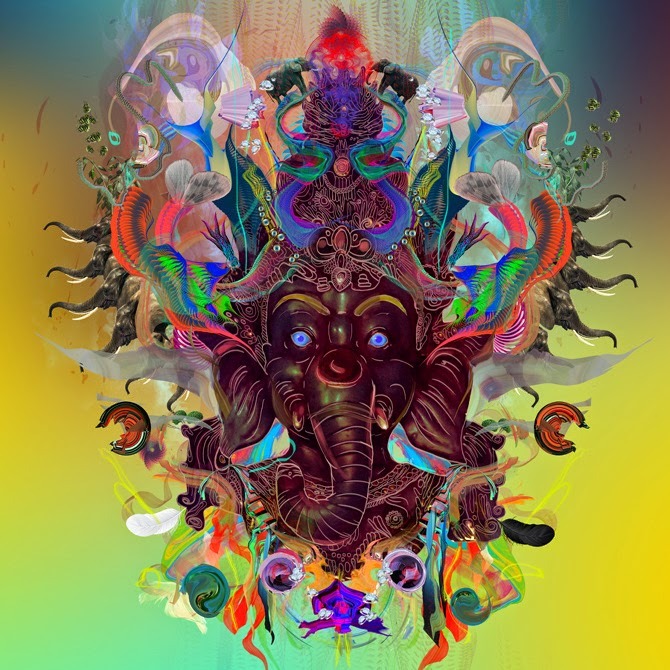 Ganesha is given dominion over the Ganas, which is a general term denoting all classes of beings, ranging from insects, animals and humans to the subtle and celestial beings. These various beings all contribute to the government of the Creation; everything from natural forces like storms and earthquakes, to the elemental qualities like fire and water, to functioning of the body’s organs and processes. If we don’t honor the Ganas, then our every action is a form of thievery, as it is unsanctioned. Therefore, instead of propitiating each Gana in order to receive their blessings, we bow to their Lord, Sri Ganesha. By receiving His grace, we receive the grace of all. He removes any potential obstacles and enables our endeavors to succeed. Such is the greatness of Sri Ganesha! 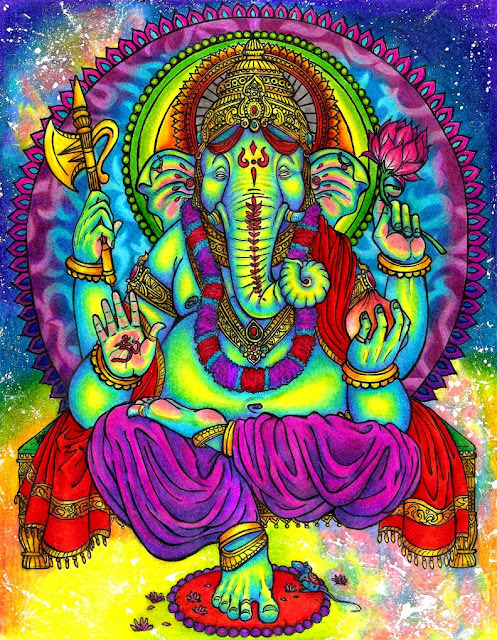 Jai Ganesha! Something interesting about the 33 Crore Gods in Hinduism ... A small part of the conversation between Śākalya and Sage Yājñavalkya, documented in 'Brihadaranyaka Upanishad - Chapter 3'. Śākalya : "How many gods are there?" Yājñavalkya : "Three hundred and three." Then he says, "Three thousand and three." Śākalya : "Is this the answer that you give me to my question, how many gods are there? Three thousand and three; three hundred and three! Have you no other answer to this question?" Yājñavalkya : There are thirty-three gods. Śākalya : "All right!" (not satisfied with answer) ...Tell me again properly; how many gods are there?" Yājñavalkya : "Six are there." Śākalya : "How many gods are there. Tell me again. Think properly." Yājñavalkya : "Only three gods are there." Śākalya : "How many gods are there? Tell again. Yājñavalkya : "Two gods are there." Śākalya : "Tell again; how many gods are there?" Yājñavalkya : "One and a half gods"
Śākalya : "What is this you say, one and a half gods. Tell again properly; how many gods are there?" Yājñavalkya : "One god is there,"
Śākalya : "All these numbers that you have mentioned – three thousand and three, three hundred and three – what are these gods? Give the names of these gods, the deities." Yājñavalkya : "All these three thousand and all that I mentioned – they are not really gods. They are only manifestations of the thirty-three. The thirty-three are the principal manifestations, and others are only their glories, radiances, manifestations, magnificences or forces, energies, powers." Śākalya : "But what are these thirty-three?" Yājñavalkya : "The thirty-three gods are eight Vasus, eleven Rudras, twelve Ādityas, then Indra and Prajāpati – these make thirty-three gods." Śākalya : "What are these Vasus which are eight in number?" Yājñavalkya : "Fire is one deity; earth is one deity; air is another; the atmosphere is one deity; the sun is one deity; the heaven is one deity; moon is one deity; the stars are one deity. These constitute eight groups"
Śākalya : "Why do you call them Vasus?" Yājñavalkya : "Everything is deposited as it were in these constituent principles. Therefore, they are called Vasus." Śākalya : "Who are the Rudras?" Yājñavalkya : "The ten senses and the mind make eleven. These are the Rudras." Śākalya : "What are the twelve Ādityas, the suns?" Yājñavalkya : "They are twelve forces of the sun, takes away the vitality of people." Śākalya : "Who is Indra? Who is Prajāpati?" Yājñavalkya : "The rain cloud can be called Indra. Sacrifice can be called Prajāpati." Śākalya : "What do you mean by rain cloud?" Yājñavalkya : "By rain cloud I do not actually mean the cloud, but the lightning which is the embodiment of energy."